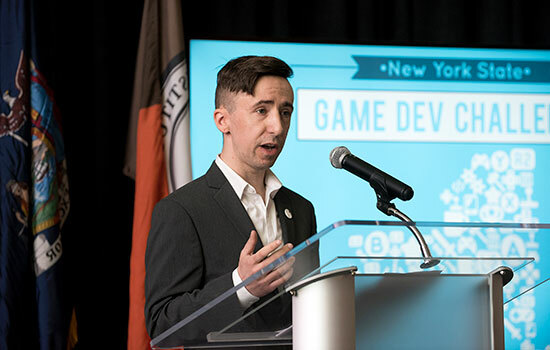 Rob Mostyn, New York State Game Challenge administrator and Digital Games Hub Coordinator at RIT, announces the winners of last yearâ€™s Game Dev Challenge at The Strong National Museum of Play. Rochester Institute of Technology’s Center for Media, Arts, Games, Interaction and Creativity (MAGIC) will host the kick-off event for its second New York State Game Dev Challenge. The event is at 4 p.m. on Friday, Jan. 19, in RIT’s Student Innovation Hall. The challenge is an opportunity for students enrolled in New York state colleges and universities and indie developers residing within the state to bring their game ideas to production. Winners in two categories will be awarded up to $25,000 in funding to aid in the development and production of their game; will be included in an on-site incubator at RIT, New York University or Rensselaer Polytechnic Institute for up to one year; and will have access to a mentor network. Entrants will be judged on their game idea pitch, game prototype, business plan, mentorship plan and development timeline. RIT’s MAGIC Center held the inaugural challenge in 2017. Forty entries were received, including 18 from college students and 22 from indie game developers. The challenge is officially underway starting Jan. 1, with submissions being accepted until March 1. Winners will be announced at a ceremony at The Strong National Museum of Play on April 12. Students, faculty, community partners and local game developers have been invited to attend the kick-off event, which also features a keynote address by Simon Ebejer and Michael Bukowski from New York-based game development studio Vicarious Visions. The challenge is an initiative supported by Empire State Development and created by RIT, which was named one of three Digital Gaming Hubs in New York state. The objective for the Digital Gaming Hubs—which also include RPI and NYU—is to increase the economic impact to New York state by fostering innovation and creating collaborative activities that spur new games or companies as well as providing resources and mentoring to encourage students and entrepreneurs to enter the growing gaming industry. In addition, the gaming hubs will assist existing companies with gaming concepts, technologies and trends and host events focused on assisting the gaming community. RIT’s MAGIC Center is a nonprofit university-wide research and development laboratory and a commercial production studio that assists in efforts to bring digital media creations up to marketplace standards and commercialization. Faculty, staff and student researchers, artists and practitioners come together to create, contextualize and apply new knowledge in a multitude of related fields and disciplines as appropriate not only to STEM or the arts and humanities, but their intersection. RIT’s MAGIC Spell Studios, which will move into a new building in fall 2018, focuses on nurturing and growing new companies and publishing and distributing their projects. A Ustream app is available for both Android and iOS mobile devices; after downloading, search “RIT Events” to find the stream. For more information on the New York State Game Dev Challenge, including contest rules and submission information, go to http://magic.rit.edu/nysgamechallenge.